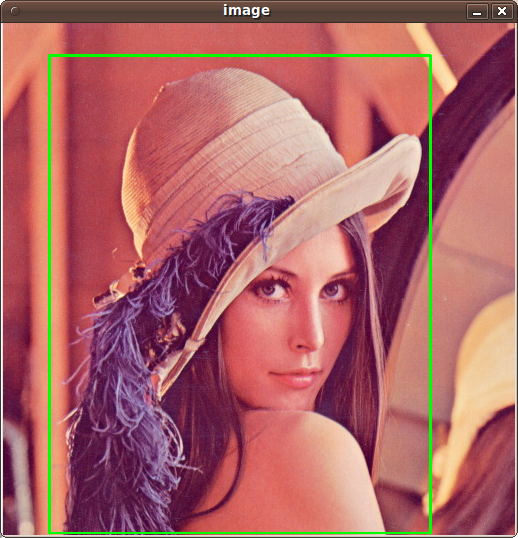 OpenCV is an excellent library for Computer Vision. I have been using it for years and it helped me a lot during my master thesis. Unfortunately, the newer version of OpenCV, 2.1, which was released on April has a slightly different installation procedure. Since it contains many bug fixes and some nice new additions, I will show you how to install it. 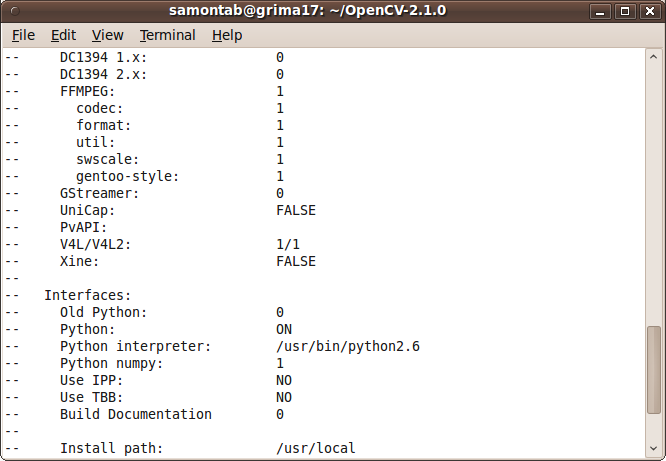 UPDATE: Install OpenCV 2.2 in Ubuntu 11.04 with Python and TBB support here. 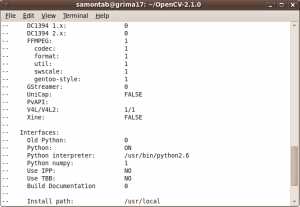 Here are the steps that I used to successfully install OpenCV 2.1 in Ubuntu 9.10. 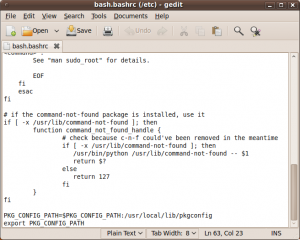 I have used this procedure for previous versions of Ubuntu as well with minor modifications (if any). 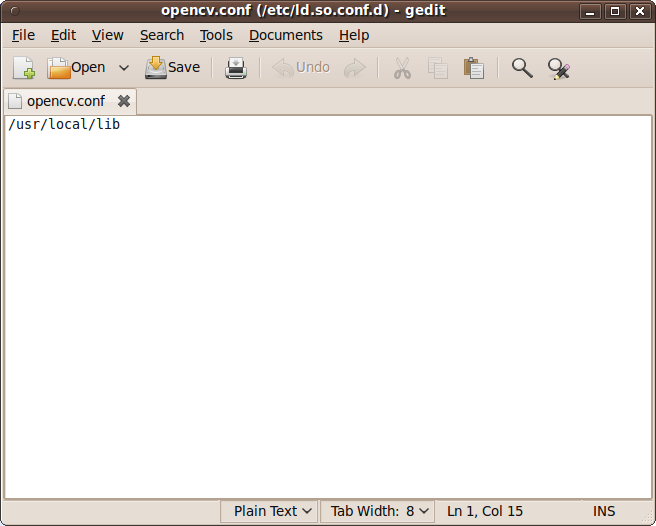 In this version of OpenCV, the configure utility has been removed. Therefore you need to use Cmake to generate the makefile. Just execute the following line at the console. 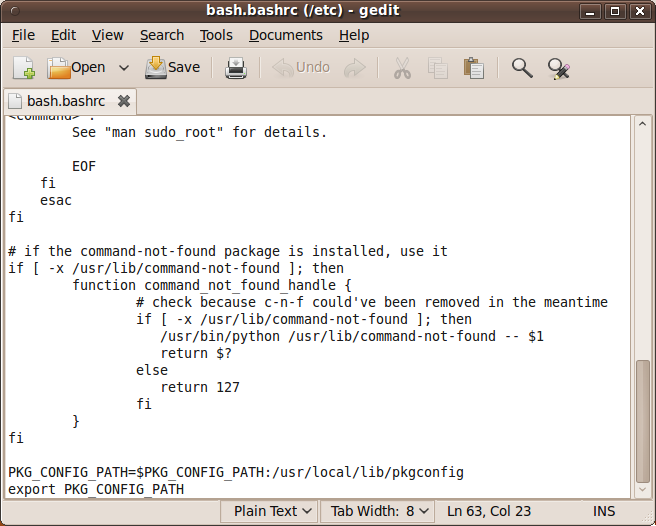 Note that there is a dot at the end of the line, it is an argument for the cmake program and it means current directory. Check that the above command produces no error and that in particular it reports FFMPEG as 1. If this is not the case you will not be able to read or write videos. Finally, open a new console, restart the computer or logout and then login again. OpenCV will not work correctly until you do this. Now you have OpenCV 2.1 installed in your computer. Note the scale parameter. It allows you to increase or decrease the size of the smallest object found in the image (faces in this case). Smaller numbers allows OpenCV to find smaller faces, which may lead to increasing the number of false detections. Also, the computation time needed gets larger when searching for smaller objects. In OpenCV 2.1, the grabcut algorithm is provided in the samples. 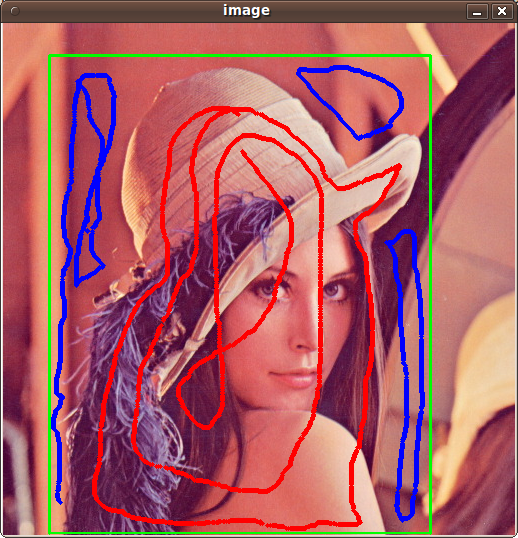 This is a very nice segmentation algorithm that needs very little user input to segment the objects in the image. For using the demo, you need to select a rectangle of the area you want to segment. Then, hold the Control key and left click to select the background (in Blue). After that, hold the Shift key and left click to select the foreground (in Red). Then press the n key to generate the segmentation. You can press n again to continue to the next iteration of the algorithm. This image shows the initial rectangle for defining the object that I want to segment. Now I roughly set the foreground (red) and background (blue). When you are ready, press the n key to run the grabcut algorithm. This image shows the result of the first iteration of the algorithm. Now let’s see some background subtraction from a video. The original video shows a hand moving in front of some trees. 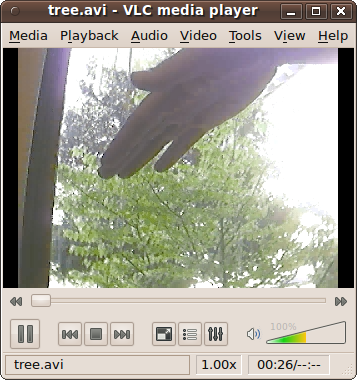 OpenCV allows you to separate the foreground (hand) from the background (trees). There are many other samples that you can try.